The most dramatic day ever!! Katie and I both woke around 9, got dressed and headed to reception to use the wifi. I was then met with a flood of messages to say that mollie had developed dengue fever and was in hospital in kuala lumpur! We couldn't believe it and then started to worry meg had it too as she'd been feeling ill the last few days, but ruled it out since she's out only 1 mosquito bite the whole trip while katie and I have been covered. Soon meg appeared, and as I began to tell her about mollie I noticed her face wasn't quite right. Strangely the night before we'd been discussing how her friend had had mumps, so as she appeared with a swollen face we assumed it was that. We asked about getting it checked on the island but were told the nearest hospital was on the mainland, and decided to go and try. Because of mollie's diagnosis we suggested meg took all her stuff with her, in case of worst case scenario that she had to stay somewhere overnight. We then headed off to the ferry port, arriving just after 11. Here we were informed that the next boat was not until 12. Meg had started to feel more unwell, so we emphasised that we needed to go asap to get to a hospital, saying that our friend was sick and that it was an emergency. They refused and kept saying 12, even when we offered more money, and finally whilst meg called her insurance company they said they would take us for 250 ringit (around £50) and when meg said she was happy to pay this we agreed, though they upped it to 300! We were not impressed but soon speeding off to the mainland. Upon arrival we attempted to connect to the wifi to order a grab and meg went to sit down. Suddenly katie was calling me over as meg had stared having a seizure. The next half an hour are a bit of a blur as random bystanders and locals helped to lie meg down using her towel as a pillow, bringing ice and cold drinks to cool her and generally offering us help and cooling an ambulance. It was slightly terrifying but after about 20 minutes an ambulance arrived, meg was loaded onto a stretcher and away we went. During the drive the ambulance staff didn't speak much English, but wanted to check meg's passport and to see if her feet were swollen at all. 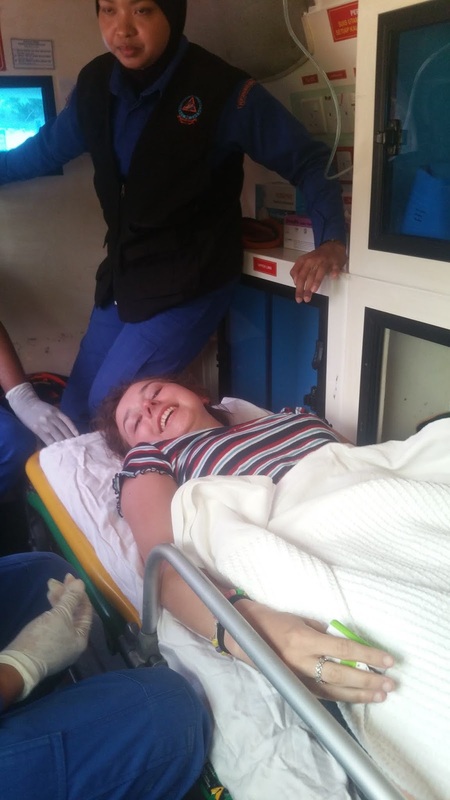 Katie had to ride in the front where the driver asked if she'd take a selfie and if she was excited for the England match- classic ambulance conversation! When we arrived meg was taken into a small room with about 10 beds which seemed to be the admissions area of A&E, and we were told to sit in a waiting room. Within seconds katie was taken by someone to pay a registration fee and the ambulance cost before they would start any treatment. The next few hours were spent sat in the waiting room contacting meg's family, googling what it could possibly be, speaking to mollie and sneaking in to see meg as much as we could. Progress was very slow and they didn't even take a blood test until about 3 hours into the visit! Surviving off only a tube of pringles and some mentos, we started to look up nearby accommodation in case we missed the last ferry. It was officially at 4pm, but we'd heard rumours of 5 or 6, too. The hospital was in the middle of nowhere essentially; just in a small town, so there were no hostels, and only one hotel we could really find. However; at around 3pm the hospital attempted to discharge meg, claiming that her blood pressure was normal! 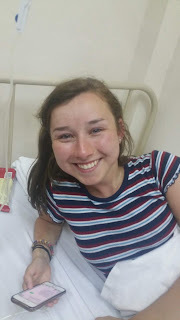 After pointing out that her face was about 10x it's usual size they agreed to run tests, especially when meg mentioned that mollie had dengue fever. Cue another few hours in the waiting room, and finally at about 4.30pm the results of the blood test came back, and meg was diagnosed with dengue fever. How katie and I dodged it when we're both covered in bites is beyond me! Of course, the blood test needed paying for (£56 paid for before) as well as a £100 deposit for her stay, so we had to hurriedly pay this, and talked to meg about what we'd do. With our stuff on the island, accommodation paid for until Saturday morning and a trip booked the following day, it made sense to go back instead of spending the night/next few nights for the sake of sneaking into the ward for a couple of minutes every few hours. We checked that the hospital were providing food, asked questions about when she'd be discharged (it would vary depending on her blood platelet level) and made sure she had bought mobile data so that she could stay in contact. The whole time in hospital meg had been conscious and even chatty, so it didn't feel like we were abandoning her on the brink of death. Just after 5 katie and I got a grab to the jetty, thinking that it was highly unlikely we'd make a ferry since the guy at our hostel had said "if you're still on the mainland at 5 or 6 just give up and come in the morning", and we had a 20 minute drive ahead of us. He dropped us very close to where the boats leave from; closer in fact than the ambulance had made it, and katie and I jumped out as someone shouted "last boat". We ran dramatically through the jetty; slightly embarrassingly when we realised it didn't go for 15 minutes, but were still shocked to have made it. After another of the unpleasant speed boat journeys we made it to dry land, and went back to our room quickly before heading out for some well needed food. We then headed down to the beach to a resort which has a free outdoor cinema, and spent the evening on the comfy chairs watching Lion and messaging mollie and Meg. It's been a much more stressful day than the one I had envisioned spent lying on the white sand and swimming in the super clear water, but thankfully both of them are in hospitals in a country where this is a pretty standard condition, getting the treatment they need to get better.